Vivekanandan Manokaran - The Weblog of a Software Engineer: Kal Raman, The Entrepreneur's Thorned Early Life !!! A Real Slum Dog Millionaire !!! A man from MANNARKOIL of Thirunelveli Dt, is now a renouned Entrepreneur in UNITED STATES!!! story of an extremely talented boy from a small village in Tamil Nadu who has risen to be the chief executive officer of a company in Seattle, USA. Kal was 15 then. "My mother got a pension of Rs 420 a month and you can imagine how tough it is to educate four children and feed five mouths with Rs 420?" Hi life changed dramatically after his father's death. The family moved from the rented house to a hut that had no proper water supply or electricity. Kal Raman remembers, "All of us used to study under the streetlight and, thank god, the streetlights used to work those days! MGR (M G Ramachandran) was the chief minister then. We had to sell the plates to buy rice to eat and my mother used to give us rice in our hands. That bad was our situation." But his mother, who had studied till the 8th standard, was very particular that her children studied. "All our relatives wanted my elder brother to stop studying and take up the small job offered by the government but my mother wanted him to continue studying." "Then they wanted me to learn typewriting and shorthand so that I could get some job after the 10th standard. But mother said, 'My children are going to get the best education I can offer. Education is our salvation.' She was my hero for her vision and she still is my hero." What kept the family going? "We were sad but because we accepted our fate, we were at peace with whatever that happened to us. We knew our father would not come back to lift us up from poverty. We also knew our salvation was a long way away." He didn't know why he used to tell his mother, "One day I will give you so much money that you will not know what to do with it!" Years later, he did exactly that! "While going in the bus with my mother to join the medical college, I told her, "If I join for medicine here, the high probability is that my life may begin and end in Tirunelveli. I really want to see the world.' She agreed with my decision to go to Chennai and join Anna University and study Electrical Engineering and Electronics." "The mess fee was Rs 250 a month and I used to be a defaulter in the mess at least six months in a year. Till you pay the mess fee, you cannot eat in the mess. So, I used to live on day scholars' lunch boxes and also use to fast. That is when I learnt to fast ! I must say a lot of friends helped me with money and food." Scarcity of money was so bad that he had no money to buy food just before the final semester exams. When he gave his final semester exams, he had not eaten for a day-and-a-half. "After finishing the exam, I almost fainted." The day after the exams came all the scholarship money that was due and it was around Rs 5,000. "So, I went home a rich man and that helped us repay some loans." He remembered the first day. "It was interesting. With bag and baggage, I went to the TCE office after taking a shower at the railway station as I had no money to go to any hotel. After the first introduction at the office, the manager noticed that I was wearing slippers to the office. He called me and said, "I don't care which college you are coming from but this is not acceptable. You should come in shoes tomorrow." I said I couldn't come in shoes the next day and this the manager construed as arrogance. "How could you talk like this?" he asked me. I said, "Sir, it is not that I don't want to, but I can't afford to buy shoes. Only after I get my first pay cheque, can I buy shoes. Sir, I request you not to terminate my job because of this. I and my family need this job." Shocked to hear the explanation, the manager asked, "Where are you staying?" and the reply was, "Dadar Railway Station." So distressed was the manager to hear Kal speak that he immediately released a month's salary in advance and also arranged for him to be at his friend's place till he could find a place to stay. "He bought me a pair of shoes and those were my first shoes. The next day, I sent Rs 1,500 from the advance to my mother." Kal's rise in career was meteoric in a short span of time. Within a month, he got a chance to move to Bengaluru (then Bangalore) and also to programming. He was at the right place at the right time. "God was there at every step guiding me to take the right decisions. I was also willing to take risks and tread new paths," Kal says. Philanthropist Mike Milken who had donated more than a billion dollars to education, wanted to use technology so that high quality education was accessible to ordinary people. Milken convinced Kal to join him. That was the time Kal was building schools in his village for poor students. 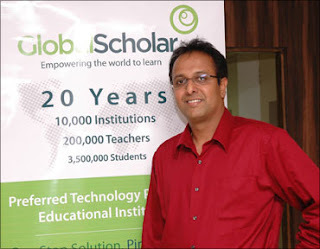 In October 2007, GlobalScholar was launched targetting both teachers and students by acquiring four companies -- National Scholar (USA), Classof1 (India), Excelsior (USA), and Ex-Logica (USA) -- that were into education. "Three months after the launch, I travelled all over the US, India, Singapore and China talking to teachers and companies and the public. I found that the only way to impact education was by impressing teachers. The biggest scarcity in the world is good teachers. We decided to help teachers with teaching practices and kids, learning practices." Kal Raman decided to concentrate on the US market as the US is more advanced in using technology. "They are also willing to pay money for technology. 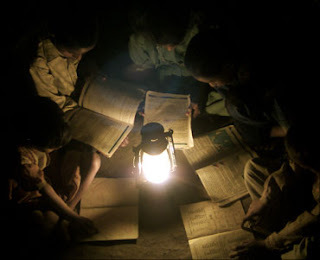 At present, schools buy the material which can be used by teachers, students and parents." Today, they have 200 people working for GlobalScholar in Chennai and 150 in the US. The study material is prepared in the Chennai office. The company that was started with $50 million will have in excess of $32 million and will generate $5 million of profits. In 2008, the turnover of the company was Rs 40 crore (Rs 400 million) and in 2009, it was Rs 80 crore (Rs 800 million). In the current year it will be 150-160 crore (Rs 1.5-1.6 billion). 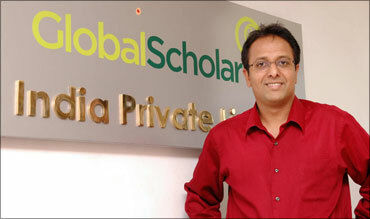 "GlobalScholar is growing at 200 per cent every year. We have 1,000 schools and 10 million students, which is one out of 10 kids in the US, using our study material. This is almost 18 per cent of the US population. We are the fastest growing education company in the US." GlobalScholar will soon introduce a pilot project in India and China. In the course of all this, Kalyana Raman became Kal Raman. "The country gave me everything and took half my name." Kal Raman is in India now for the Kumbhabhishekam of the temple at his village Mannarkoil. "It is taking place after 500 years. It is the culmination of two-and-a-half years of work. I have spent more than one and a half crore rupees (Rs 15 million) to renovate the temple and do the Kumbhabhishekam. More than anything else, I have given jobs to all my friends in the village who are masons and carpenters." Other than this, he has also adopted all the orphanages around his village and he takes care of around 2,000 kids, some of whom are physically handicapped. "I feel if I can educate these children, eventually we can make a difference in the society. We also help 100 children in their higher education. Around my village, everyone knows that if a kid who studies well cannot afford to pay fees, he has to only come to my house; his education will be taken care of." "I do not do this as charity; its my responsibility. I am giving something back to the society that fed me, taught me, and took care of me and gave me hopes. " Wonderful gesture. A very good step before a big leap I earnestly believe. We can do such good things not confining to our birth place but extending to at least our entire state and the nation as there are many deserving people, children and students awaiting our helping hands. he is an instance for +ve thinking and to work with guts. i saw his show on jaya tv,really it admired me.In todays world, indigents becoming poorer and poorer, someone like him is very much for todays world. To me there is no better existing than an personalized really like beat. This is very different than just having a beat that lets you know of him or her.